After a successful five hour operation to repair damage to his lower right leg following an early morning saw attack while training, triathlete Mhlengi Gwala is focussed on his recovery, while friends and supporters have written off the incident as an isolated “freak attack”. 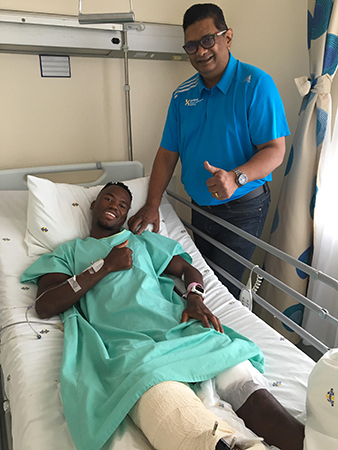 Gwala’s recovery will be overseen by the KwaZulu-Natal Department of Sport and Recreation-backed Elite Athlete Development Programme (EADP), of which he has been a member of since 2016, and Team South Africa’s Olympic Doctor Kevin Subban visited him in his Durban hospital on Thursday to guide his recovery and rehabilitation plans. “Considering the extent of the injury to his right calf, where he was cut right to the bone through nerves and blood vessels and the three main muscle groups, the surgery took around five hours to complete,” said Subban. The 26 year old has already regained feeling in his right foot, which has the medical team optimistic about his chances of recovery. “Holding him in good stead is his pre-conditioning. He is fit and healthy which we hope will help him,” he added. Subban said Gwala’s strong character would be an asset in his recovery. “From a personality perspective he is such a brilliant guy. All the other guys that are here and part of the EADP look up to him,” said Subban. Gwala’s recovery and rehabilitation will be driven by the EADP team at Prime Human Performance Institute based at Durban’s Moses Mabhida Stadium. “He has everything that he will need right here at Prime and through the EADP, from doctors, to physio’s, to bio’s as well as psychological, and we will continue to provide support from a nutrition perspective. “The positive is that the muscles will heal faster but the concern is the neural side,” explained Subban. “The nerves will take longer to heal and sometime they don’t heal 100 percent. That, in my opinion, is our greatest concern at this stage,” Subban explained. Police investigating the attack have yet to give any idea of motive for the incident, but friends and supporters of Gwala says it won’t deter their approach to triathlon training. Damian Bradley, the organiser of the MiWayLife Durban Ultra Triathlon that doubled as the SA Ultra Triathlon Championships that Gwala took part in on the weekend, says the Chesterville triathlete and professional lifeguard is shocked but feeling positive. “(His best friend and fellow triathlete) Sandile Shange has been an unbelievable support to him,” said Bradley after visiting Gwala in hospital. “Overall Mhlengi is very positive, and says he is tired of being in hospital already,” said Bradley. Bradley, the triathlon community, as well as the lifesaving community have rallied around Gwala’s recovery, and crowd funding has raised over R300 000 for him already, most of which has come from small donations from the large number of people touched by the senseless attack. “He is such a gentleman, and has shown such character to get through tough times in his life to be the successful triathlete that he is today, that I am sure he will bounce back from this incident,” he added. “Most of all he doesn’t want athletes to be put off by what has happened to him,” said Bradley. “No matter what sport you are involved in, and whether you are an elite or a recreational athlete, getting up early to train is part of your lifestyle. “Mhlengi doesn’t want anyone to feel intimidated by this incident, and to feel that early morning training is no longer safe. He is adamant that it is a random, senseless attack, and shouldn’t deter anyone from the training routines they are used to,” Bradley said. Away from triathlon, Gwala is a keen member of the Marine Surf Lifesaving Club, another group of people that have shown great concern for the young man’s recovery. Bradley said the Gwala was fortunate to have all the resources of the EADP at his disposal and some of the best medical experts on the continent. “Mhlengi is fortunate to have a world class team looking after him through the EADP,” said Bradley. “Doc Kevin Subban is positive, and there is a team if biokineticists and physios that will be there for him every step of the way,” he added. “He has overcome a lot in his life to be where he is today, “said EADP director Dennis Jackson, speaking of Gwala’s well documented journey from drug and alcohol dependency. “This will stand him in good stead in his recovery. “Not only will he have a great team around him for support but he will also have his fellow triathletes and many other athletes who are like a small family who have rallied and will continue to rally around him,” he added.